The official International Cup Captain's Lunch took place on Monday. 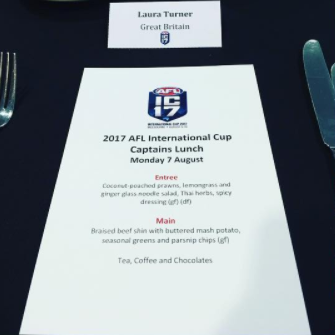 Captains from all teams along with a host of AFL executives were treated to a two course lunch at Etihad Stadium. AFL CEO GillIon McLachlan thanked all the captains for their investment and role in developing the game overseas. It always seems to be impressive to AFL fanatics that people overseas fall in love with the strange and unique game often with little exposure to it. Head of Community and International Development Grant Williams gave a speech about the growth of the game overseas and made particular reference to the growth of women's footy at home and overseas welcoming the new women's teams to the International Cup, Great Britain, Pakistan and the efforts of the European Crusaders for bringing together women from across Europe to participate in the tournament. He introduced some of the captains to tell their unique stories about their journey into footy. The Japanese captain Michito Sakaki talked about what it was like to attend every IC since the establishment of the tournament (15 years and counting!). The Croatian captain Tomislav Cvetko discussed the distance his players often travel to play and how footy for the Croatian team means play hard then party hard. Irish captain Onóra Mulcahy told the group about her crossover from Gaelic football to AFL whilst living in London and how far she has come with the physical side of the game being one of the toughest tacklers on the Irish team. Finally Prudence Sindriwen from Papua New Guinea told the group about her role with the AFL PNG in the development of female and youth programmes at home and urged other captains to lead this development too. Talking to the other captains about their stories back home I was particularly interested in how the women's game and youth football is being developed. It is clear that leaders and those who have experienced this IC have a great responsibility to grow the game when they return to their respective countries. The event concluded with an abridged version of The Star Spangled Banner from the American captains (never brag to Gillion McLachlan that you have a good singing voice) and the captains were presented with a beautiful gift of an Aboriginal piece of art. Then a tour of the Etihad Stadium; a very impressive building. For this captain I hope to be back here in two weeks time lifting the trophy and being crowned International Cup winners.